«art by accident» takes the audience on an unpredicted journey through time and space. The project is inspired by the concept Rube Goldberg machine, usually including a chain reaction. Chain reaction is an intuitively simple concept, but one that allows for an incredibly complex and deep investigation into something we experience every day: the relationship between cause and effect. 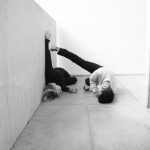 Choreographers/dancers: Tanja Andreeva, Marthe Mythen Eriksen, Tony Tran, Hedda Rivrud.